I do think that Verna is my new best friend! After so much cold and snow here in Nebraska, everyone you talk to is ready for a much needed dose of spring. 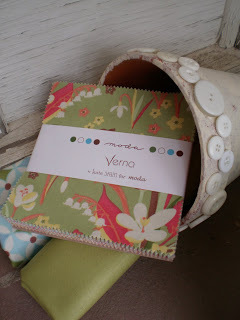 As soon as I saw the Verna collection, I instantly thought of fresh flowers, just waiting to be cut for a bouquet. No matter the season in your neck of the woods, you can bring a dose of spring inside. 1. Choose 40 charm squares (5″ x 5″). A charm pack usually has 42 squares. You can go ahead and cut all 42, that will give you a few extra choices for color selection. 2. 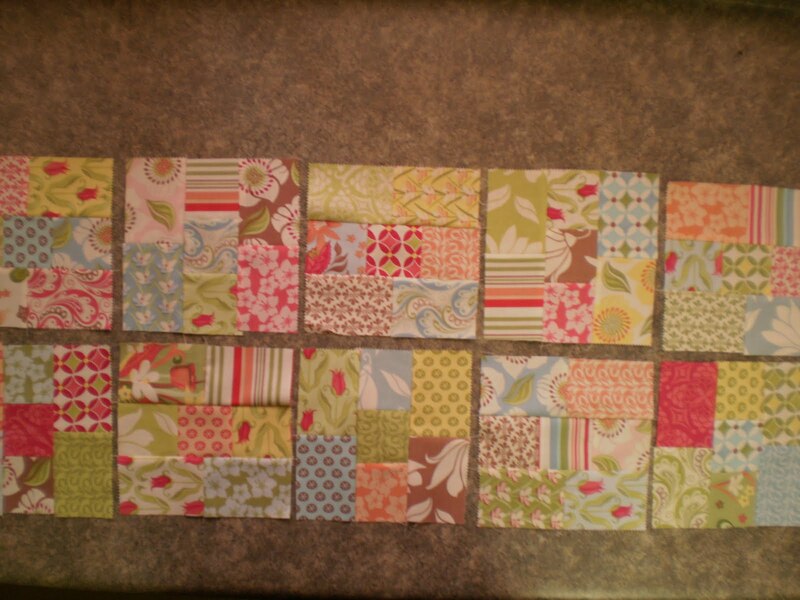 Cut each charm square in half to create two pieces each 2 1/2″ x 5″. I find that I can stack about 4-6 charms to cut at once. Cut as many layers at once as you feel you can accurately handle. 3. 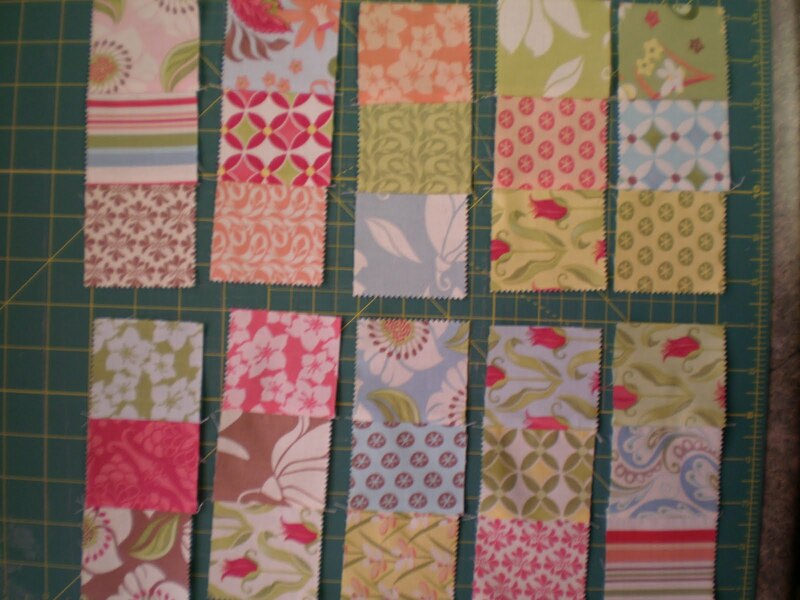 From each charm square, cut ONE of the 2 1/2″ x 5″ rectangles into two squares, each 2 1/2″ x 2 1/2″. This will give you a total of eighty 2 1/2″ x 2 1/2″ squares. 4. Cut the remaining 2 1/2″ x 5″ rectangle into one 2 1/2″ x 3 1/2″ rectangle and one 2 1/2″ x 1 1/2″ rectangle. This will yield forty rectangles of each size. The 2 1/2″ x 3 1/2″ rectangles will be used for this project. 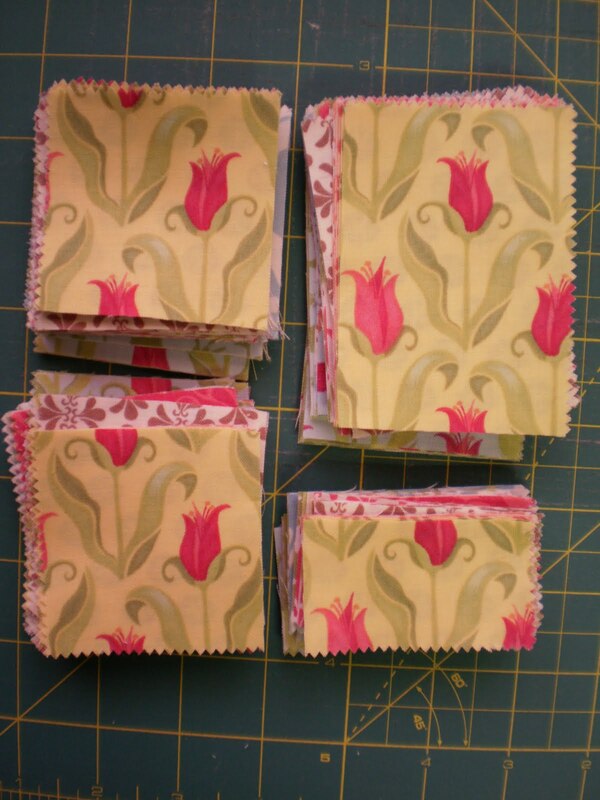 Set aside the 1 1/2″ x 2 1/2″ rectangles to use for another project. 6. 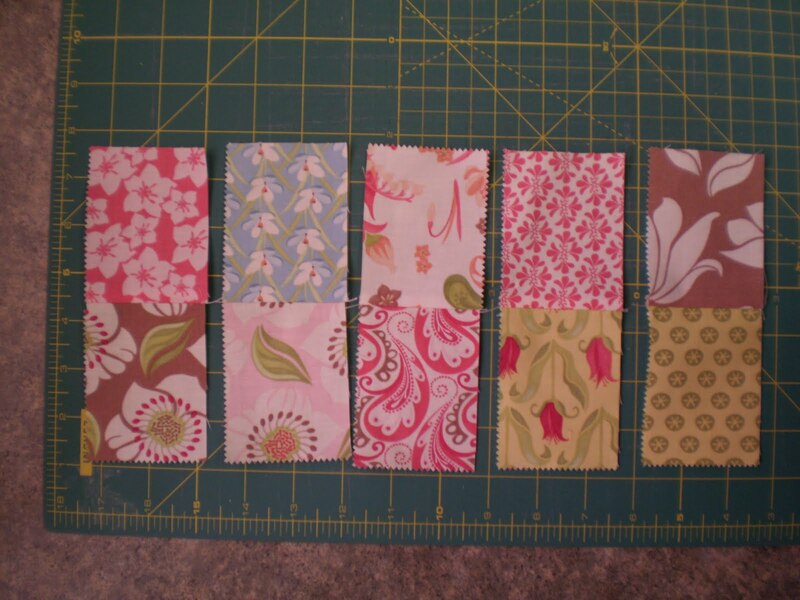 Choose three of the 2 1/2″ squares to sew together side by side. 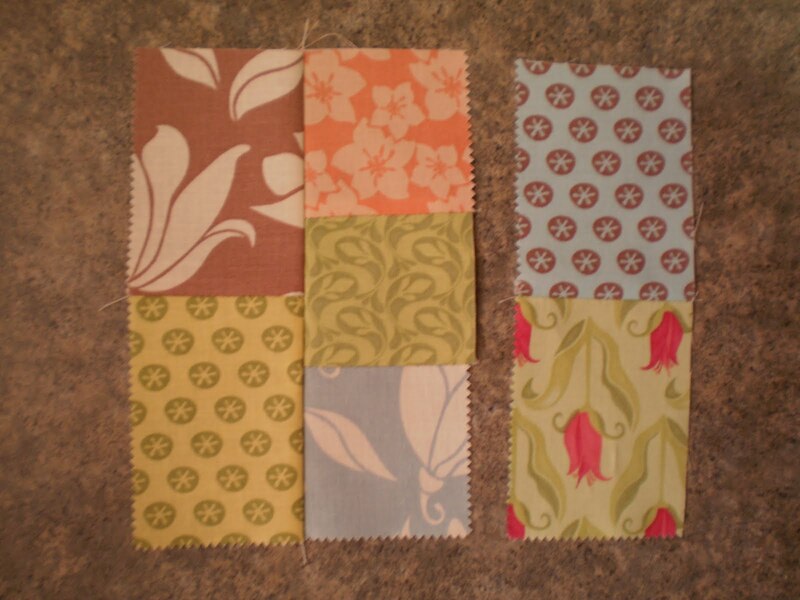 Mix up the colors and patterns for each set. Make 10 sets of three squares. This unit should now measure 2 1/2″ x 6 1/2″. 7. 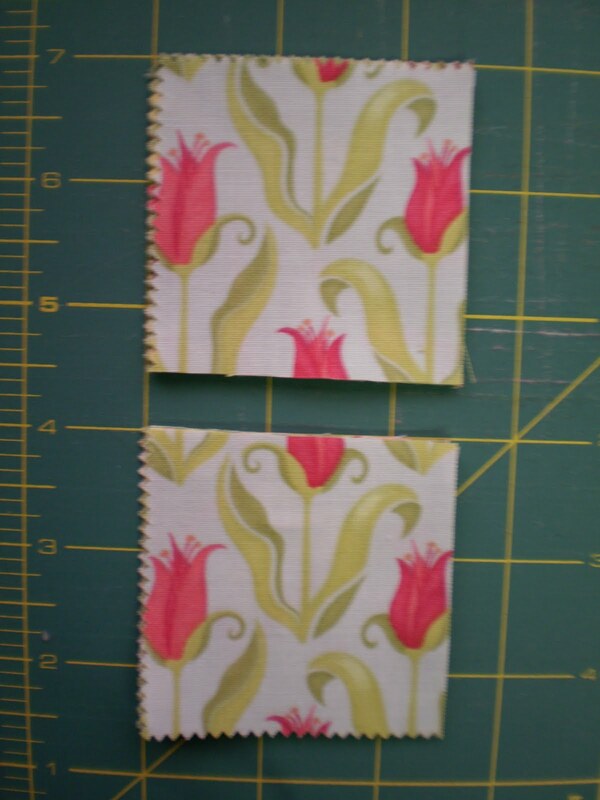 Choose two of the 2 1/2″ x 3 1/2″ rectangles to sew together end to end. 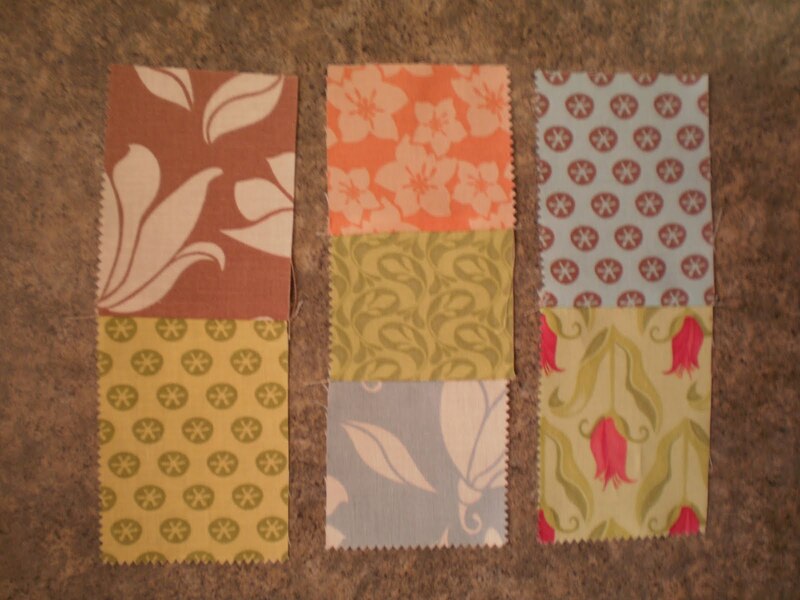 Mix up the colors and patterns for each set. Make 20 sets of two rectangles. This unit should now measure 2 1/2″ x 6 1/2″. 8. Select two units made from the 2 1/2″ x 3 1/2″ rectangles and one unit made from the 2 1/2″ squares. Arrange units as shown below. 9. Join the units together to form a block. 10. The block should now measure 6 1/2″ x 6 1/2″. Make a total of 10 blocks. 11. Arrange the blocks in 2 rows of five blocks each. 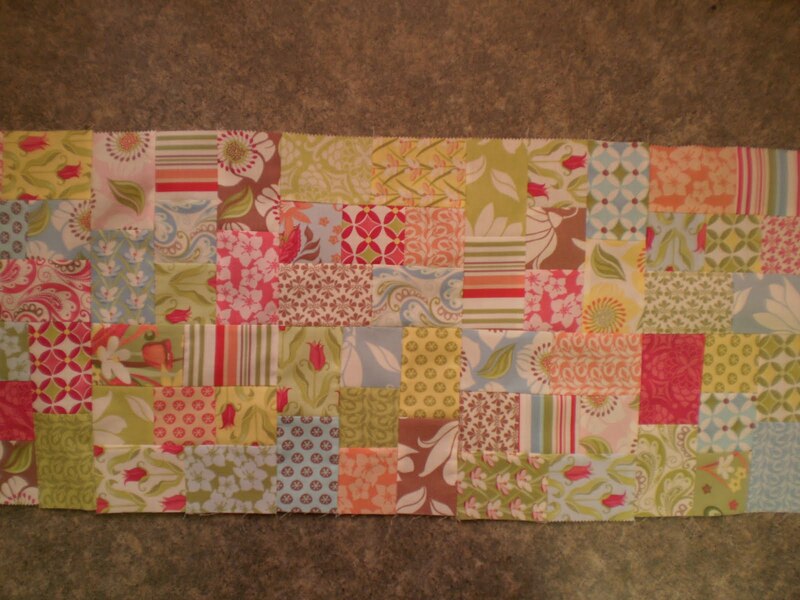 Rotate every other block a quarter turn to alternate the position of the blocks and add interest to your design. 12. Sew blocks into rows, then join the rows together. Unit should measure 12 1/2″ x 30 1/2″. 13. Cut three clover green strips 1 1/2″ x approximately 42″ for inner border. Measure the length of the runner. 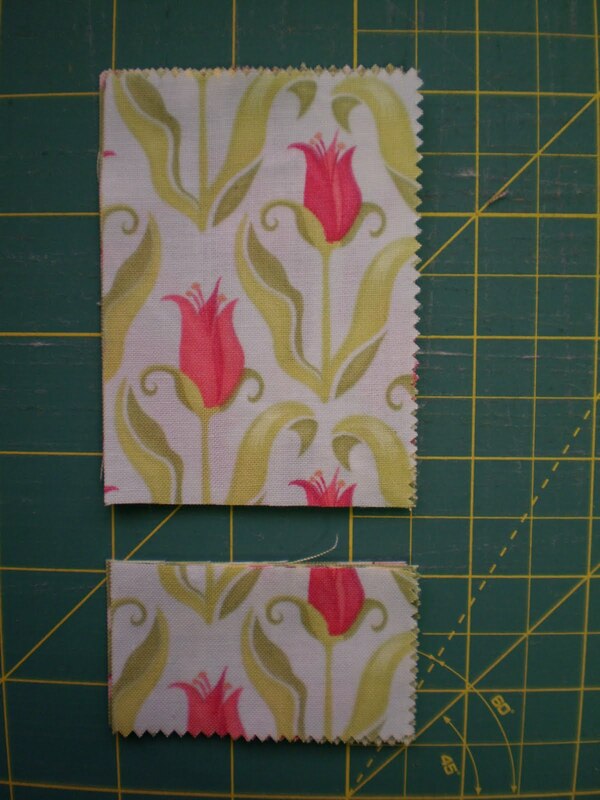 Cut two border strips to this length. (Measurement should be 30 1/2″). 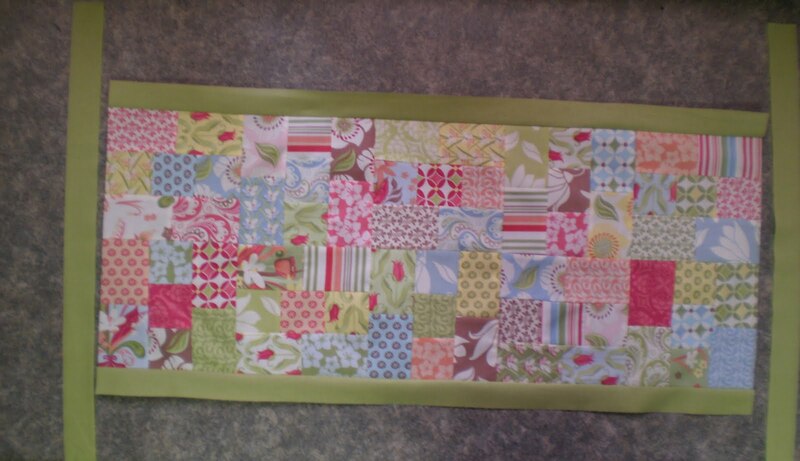 Sew border strips to sides of the runner. Measure the width of the runner. 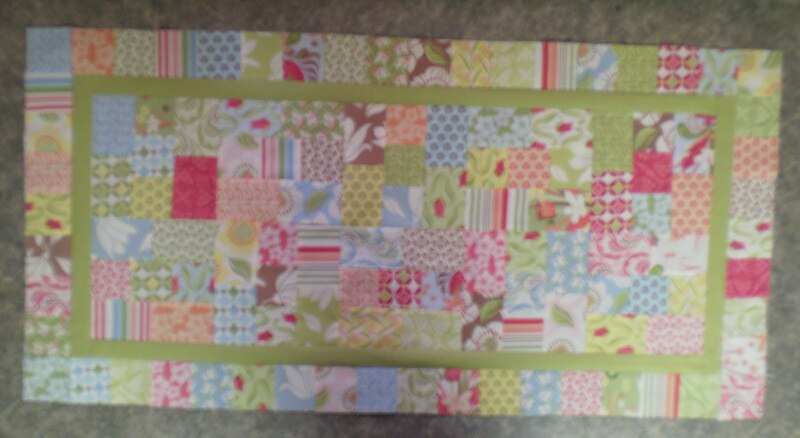 Cut two border strips to this length. (Measurement should be 14 1/2″). Sew border strips to the ends of the runner. 14. 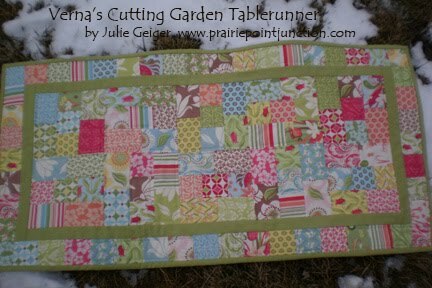 Choose 16 of the 2 1/2″ squares to form the side border. Sew squares side by side. Unit should measure 2 1/2″ x 32 1/2″. Make two units. Sew to sides of the runner. 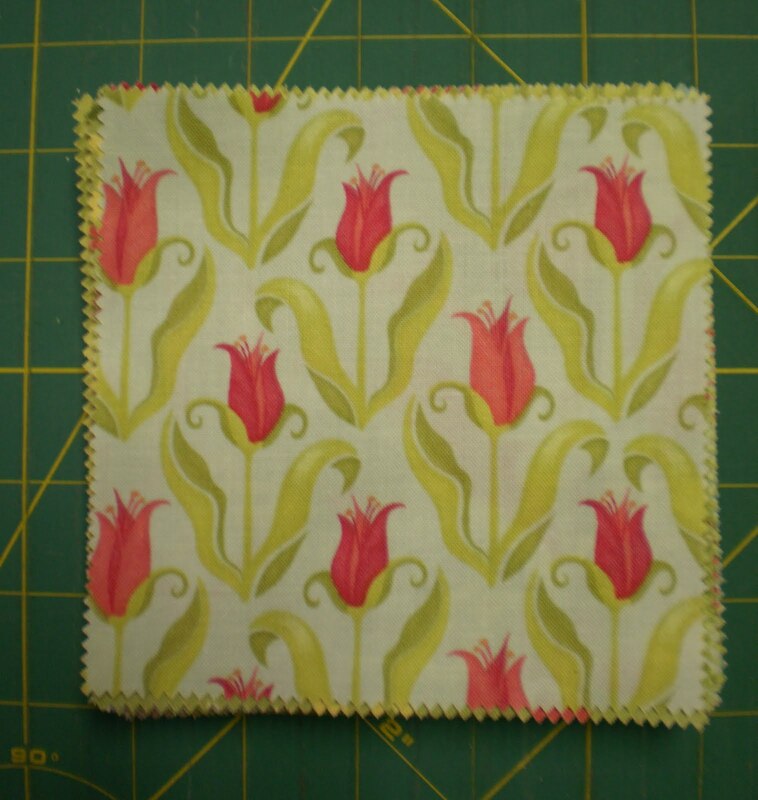 Choose 9 of the 2 1/2″ squares to form the end border. Sew squares side by side. Unit should measure 2 1/2″ x 18 1/2″. Make two units. Sew to ends of the runner. 15. Runner should now measure 18 1/2″ x 30 1/2″. Layer runner top with batting and backing. Quilt as desired. 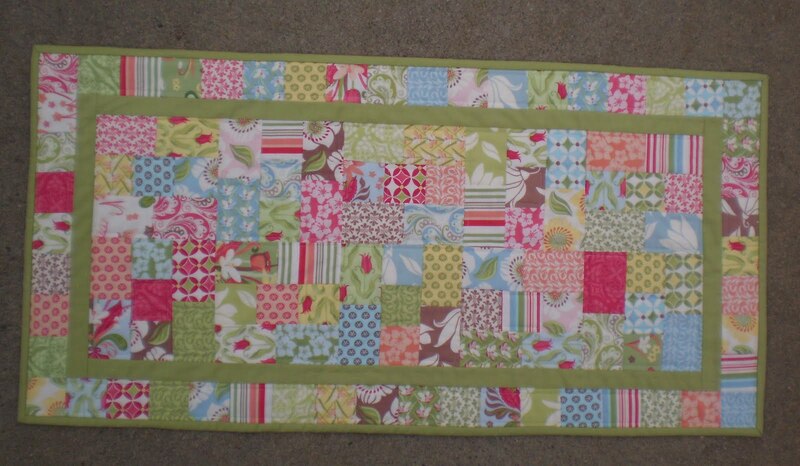 I quilted 1/4″ inside the center square of the block and 1/4″ around the inside edge of each block. 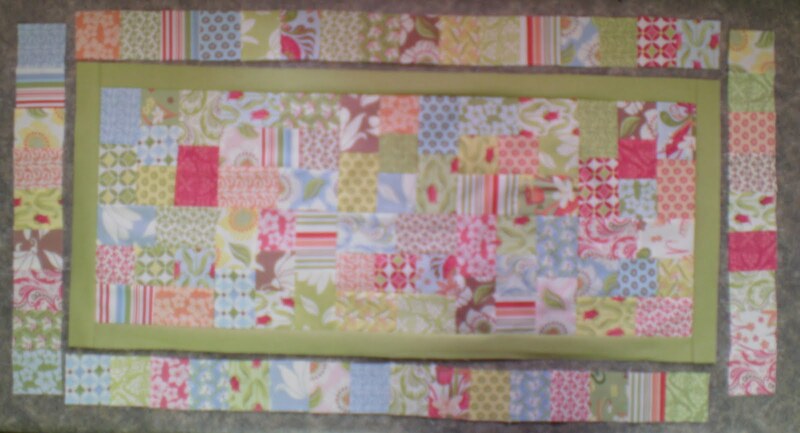 I also quilted two straight lines 1/4″ away from the inner green border, and 5/8″ from the outside edge of the runner (to accomodate for the binding). 16. 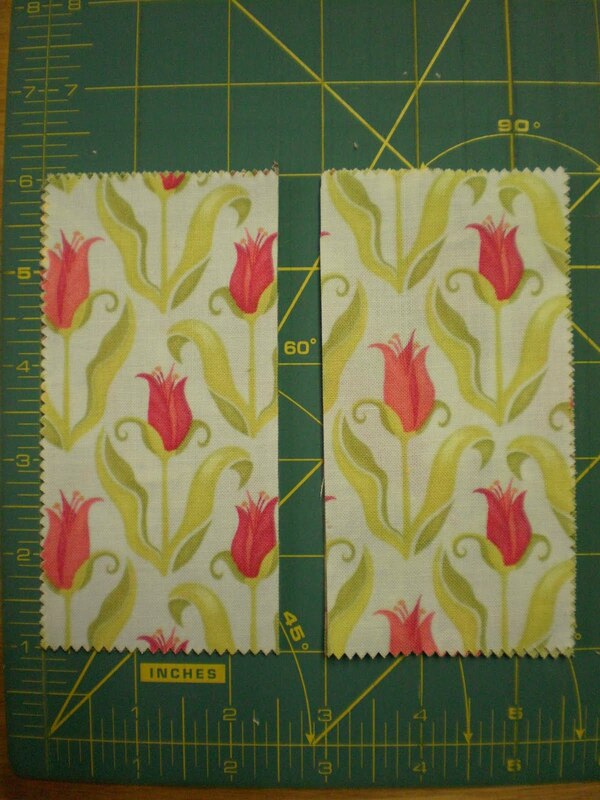 Cut three clover green strips 2 1/2″ x approximatley 42″ for binding. Join strips together diagonally end to end. Fold strip lengthwise with wrong side together, press. Sew raw edges to edge of runner, mitering corners. Bring folded edge around to back of runner. Hand tack in place on back of runner. 17. Enjoy the first signs of spring! 1 runner approximately 18″ x 36″. Thanks for sewing with me . . . 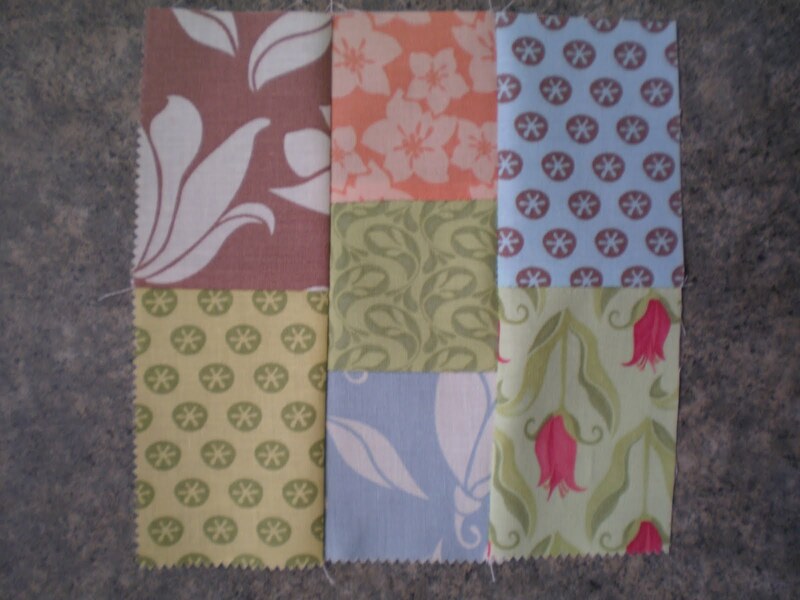 This entry was posted in Charm Pack, Easy, Home Decor and tagged Kate Spain, Verna.